The TetraBrazil curriculum has been designed by an organization of professional soccer educators in Brazil to provide teams, coaches and players in North America with the same expert level of training received by the Professional Brazilian Clubs. Campers will warm up to samba music, learn Portuguese phrases and discover what it is like to grow up in a country where playing soccer is treated like a religion. Every camper will also have access to iCHALLENGE, our brand new App along with a library of soccer skills and exercises. Campers will be able to continue to practice at home after camp and will be shown how to: view and practice the skills linked to their ability level, upload a video completing their chosen skills, receive personalized online coaching from a member of our experienced virtual coaching team, and even score points for videos and compete in league tables with other players from across the world. They can also follow and vote for the other players as well as challenging them to innovative freestyle duels! The camp will run Monday through Friday and each child will be coached by a member of Challenger’s International coaching staff flown to the USA exclusively to work on these programs. 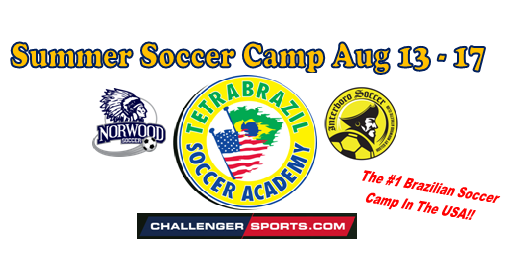 Challenger will hold over 3,500 British Soccer Camps/TetraBrazil this summer and will coach over 200,000 players between the ages of 3 and 18 on camps and clinics nationwide. Since 1999, TetraBrazil Soccer Academy has been bringing Brazilian soccer expertise to American soccer players. Through a series of soccer camps, team clinics and tours to Brazil programs, TetraBrazil offers young American players the opportunity to experience first hand the kind of soccer training that has made Brazilian soccer the best in the world! In addition, any child who signs up online before June 1st will receive a genuineTetraBrazil replica Jersey valued at $39.